People, who are compatible in every other way, may have sleep preferences that cause concerns with their mate. Difficulties arise when you've had a poor night's sleep. Many times, the problem is not the bed, it's the inflexible, conventional bed linens. Share your Bed, not your Covers! Some like it hot, others might not. Most vary between the two. Whether you like tons of layers or none at all, DoubleUps for Beds split sheet and comforter designs accommodate all types of sleepers in the same bed. Ask any pregnant or menopausal woman – their body temp can and will change at the drop of a hat. Covers on, covers off, back and forth each night. When you're struggling with temperature changes, it is nice not to disturb your mate. Our sheets are split designed to help cope with the difficulties of pregnancy and menopause. Please visit our products section to find DoubleUps for Beds sheets and accessories that can help you. For more information and helpful sleep hints, visit the Sleep Foundation. It may not be the worst crime you can commit, but a sheet stealer can definitely cramp your sleep style. DoubleUps for Beds takes the competition out of the bedroom – letting each sleeper "steal" their own side of the covers without bothering their bedmate. Watch the short video on the right to see how the DoubleUps patented design works. Kids like to have sleepovers, and when they do the bed can become a battleground. DoubleUps for Beds let kids share their bed, not their bedding. It's a peaceful solution (and a good night's sleep) for everyone. Pet owners know that going to bed alone at night doesn't necessarily mean you'll wake up alone later. DoubleUps for Beds allows you the freedom to roll, without the weight of your pet holding you back. Free flowing or tucked beneath the mattress? Do you or your bedmate like the "mummy wrap?" 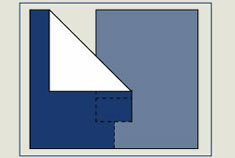 No matter what you prefer, DoubleUps for Beds lets both sleepers select their style without affecting their partner. Although we can't ease the symptoms of Restless Leg Syndrome, the DoubleUps for Beds patented split top designs allows one sleeper's restless with the covers to not bother their bedmate. For more information about Restless Leg Syndrome, check out Google! If you answered YES to any of these, DoubleUps for Beds is the perfect solution for you! 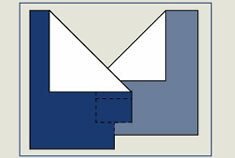 DoubleUps for Beds is comprised of a left and right side. 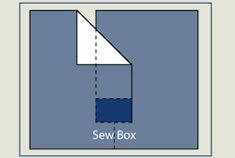 DoubleUps for Beds held together by a patented sew box. 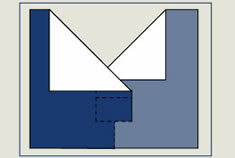 One side can be pulled away without affecting the other side. DoubleUps for Beds bedding is able to adapt to almost any sleeping situation. 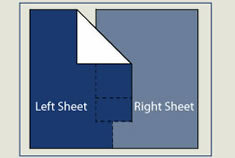 The bottom of the sheet may be tucked in on one side and untucked on the other.